What are the mysterious two sauces, you might be wondering? 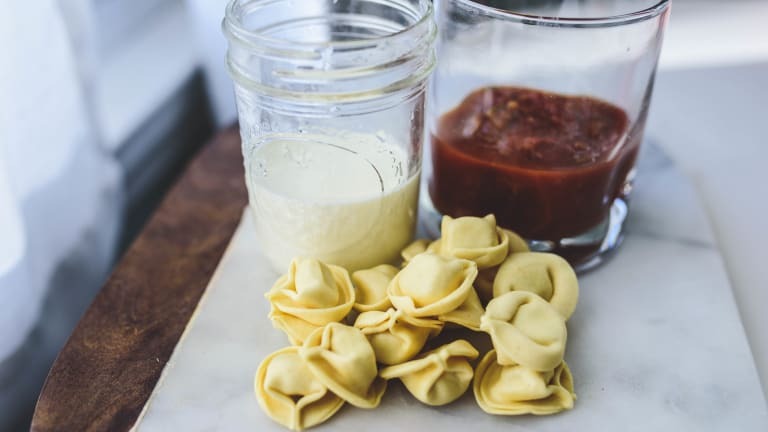 You’ll be making a basic (delicious) Alfredo sauce and also topping your tortellini with a little marinara sauce. The two sauces make the dish more interesting and elegant for serving to guests. I have always loved a creamy red sauce. Paleo: Use Paleo noodles of choice; use coconut cream instead of heavy cream; omit cheese and add more garlic, if desired. 1. Bring a large pot of water to boil. Cook tortellini according to package instructions (they do not take long to cook). 2. Heat a large skillet or wok pan over medium heat. Add the butter to the skillet. When butter is melted, add garlic and cook, stirring nearly constantly, until garlic is fragrant, but not browned. 3. Add the heavy cream to the pan and let it come to a light simmer (you don’t want it to boil rapidly). Simmer for about 3 minutes. 4. Add grated Parmesan and stir constantly for about 2 minutes. Let the sauce lightly simmer another 2 minutes or so. 5. Heat the marinara sauce in a small saucepan. 6. Toss the cooked tortellini into the pan with the Alfredo sauce and stir until coated. Serve up onto plates and top each serving with a couple tablespoons of warm marinara sauce.